Oh, Hopkinsville. I always try to give you the benefit of the doubt, but here you go annoying me again. Many of us were ecstatic when we saw the old Skinny's Diner/Chicago Style Grill building on the boulevard morph into Osaka Japanese restaurant. Hopkinsville, I'm told, used to have an excellent sushi restaurant until their chef returned to his homeland and the place shuttered it's sprawling plantation-style building. The classy building eventually reopened as a smokey sportsbar that felt (and tasted, in my opinion) more like someone's ugly basement than a restaurant. I digress. Knowing that the owners were Chinese, and the restaurant was no where near bodies of water that contain fish commonly used in sushi, I wasn't expecting it to offer the cuisine of it's namesake city (where Joe and I were unable to even afford the sushi when we visited.) However, I would expect the staff to be a little bit familiar with their menu offerings. And how to pronounce the word "tofu." And for the chef to prepare dishes according to the menu description. Suffice it to say, my mom and I were dually unimpressed. And our comiserating probably ruined it for the rest of our party... sorry, guys. We moody foodies can't help ourselves. I was really wanting to like the restaurant, too. I've been longing for a sushi place to succeed here, especially since half of the clientele at Yamato's just across the state line have Kentucky plates. But I have little hope for this newest eatery. 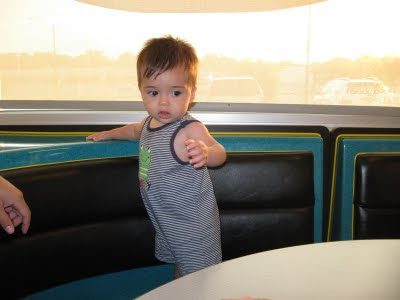 Stephen did enjoy the corner booth... at least until he threw up tofu and a cup of pool water all over daddy's lap. My next "bone" isn't exactly Hopkinsville's fault. From reading this blog and my old New Era columns, you might have picked up that I'm a Kroger grocery store fan. I do force myself into Aldi from time to time because it's supposed to be cheaper, but I think I find the best deals in the little orange "manager's special" stickers at Kroger. Plus, it's gotten to where I know their sale cycle... namely the beloved "10 for 10" sales. They come around every 5 or 6 weeks-- and I can get boxes of pasta, frozen vegetables, brownie mixes, good hand soap and other kitchen staples for what I consider reasonable prices. I'm the girl in the self-check out with 15 bags of frozen Brussels sprouts, lima beans and chopped spinach. And at 16 ounces each, the bags supply 15 dinner's worth of veggies to cram into my freezer. But as I eagerly awaited 10 for 10 week this past month, I noticed some snazzy new changes in my freezer aisle: lights that dimmed until a customer activated a motion sensor, doors that were completely fogged up and more stylish packaging on the store's generic frozen vegetables. That's when it hit me. Prettier packaging... but smaller bags. No longer can my George Washington get me 16 beautiful ounces of cauliflower... rather just 12 skimpy ounces. I squinted at the price label. Sure enough, it read 10/$10.00, 12 oz. Cauliflower. My eyes raced along the shelves holding an expanse of swanklily packaged produce. 12 oz. 12 oz. 12 oz. Surely, this makes it so there's no savings at all. In an effort to cheat the system one last time, I dug behind the puny bags and unearthed the remaining 16 ounce packages in their dowdy white wrappers, and pitched them into my cart. To my temporary satisfaction, they rang up at a dollar each. But my days of feeling like I got a good deal are coming to a close. I suppose stores and producers across the country have been sneeking in ways to give the consumer less for more. But it burns me that while burger and soda sizes have increased exponentially over the years, my humble but wholesome sack of veggies is dwindling.